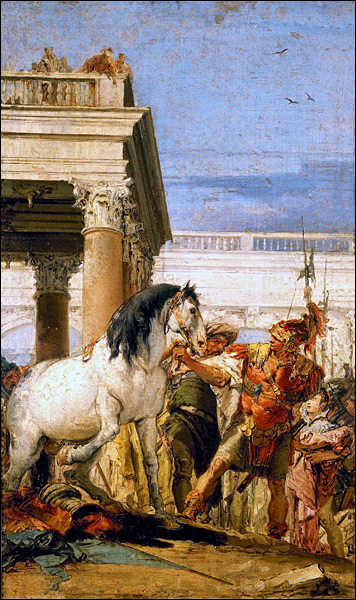 Giovanni Tiepolo was a Venetian painter in the Rococo style. The painting is undated, perhaps the early 1740s. Bucephalus was Alexander the Great's horse, an unusually large animal, black with a white star-shape on his forehead. No one had tamed the beast so Alexander successfully took the challenge, which is the event depicted in the painting. The headline at RT says it all: "Why stop at burning books, when libraries themselves are 'sites of whiteness,' librarian suggests". 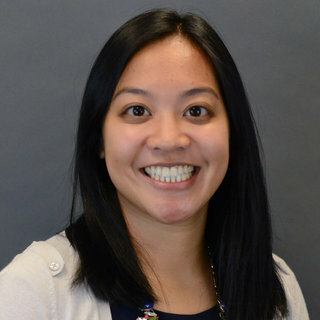 She complains, "collections are physically taking up space in our libraries"
The librarian is Sofia Leung , the "Teaching And Learning Program Manager" at MIT Libraries . "I'm a second generation Chinese American and native New Yorker currently living in the Boston area," she says. Pretty much explains everything, ayewott? If you look at any United States library's collection, especially those in higher education institutions, most of the collections (books, journals, archival papers, other media, etc.) are written by white dudes writing about white ideas, white things, or ideas, people, and things they stole from POC and then claimed as white property with all of the “rights to use and enjoyment of” that Harris describes in her article. When most of our collections filled with this so-called “knowledge,” it continues to validate only white voices and perspectives and erases the voices of people of color. Collections are representations of what librarians (or faculty) deem to be authoritative knowledge and as we know, this field and educational institutions, historically, and currently, have been sites of whiteness. She's taken down the post but the internet never forgets. Here's the link to the archive . An ongoing and relentless purge of politically incorrect academic thought at institutions of higher learning has been proceeding apace. 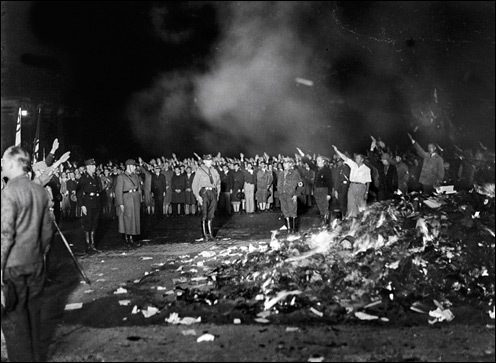 Librarians call it weeding and have already removed millions of books from campus collections... It's not fringe behavior, but a program abroad in the noonday sun. We can't write this off as mere incompetence. As they tell everyone who will listen, as they say in every way they know how, white people are to be scourged, demoralized and cursed as a blight on humanity. It's said a lie is halfway around the world before truth gets its shoes on. Maybe so. But when truth gets its shoes on it's time for "trampling out the vintage where the grapes of wrath are stored". From Taki at Taki's Magazine, about "reparations"
There is no such thing as a collective inherited crime. The fact that the American public was dead-set against open borders for decades, but got open borders anyway, is proof that we are ruled by a malevolent elite and avaricious oligarchy. In a system collapse, your vote cannot matter. The system is saving itself. It isn’t leaving anyone alone. Democracy fails because people can vote for free stuff paid for by other people, but even more, they can vote for personal wants that create costs which are then absorbed by all of society. Jefferson’s America, in terms of communications and travel, had more in common with Ancient Greece than it did Lincoln’s America. What really happens when marginal rates go up to 70%. Do the rich pay more tax? No. Instead the world becomes infested with tax shelters and other avoidance schemes, which produce tremendous waste. Civilization absolutely depends on long term time preferences, on men planting trees in the shade of which they will never sit. One of the major factors resulting in people of European ancestry being able to wrestle the Western Hemisphere from the native peoples was that Europeans grasped the concept of a "campaign" while the native peoples were focused on the "battle". The Mueller Report itself was the mendacious conclusion to a deceitful investigation, the purpose of which was to conceal the criminal conduct of US government officials meddling in the 2016 election, in collusion with the Hillary Clinton campaign, to derail Mr. Trump’s campaign, and then disable him when he managed to win the election. This report reads, in fact, as if Trump was supposed to cooperate in his own obstruction. And because he didn’t, he’s guilty of obstruction. The US isn’t so much a country as a country club. Membership has its privileges, and members don’t care at all what life is like for those who are in the country but aren’t members of the club. This nonsense is going to continue until someone lights up a squad of troops, from one side or the other, and possibly both ways. Or somebody just disappears. What we see is a flow of value from the still vast numbers of productive people and regions into the center, in the US this is a few mega-cities like Washington DC, NYC, San Francisco. From there resources flow back “out”, not to the people who make good use of them but to vast numbers of insane women, parasites, criminals, thugs, addicts, ethnic mafias, and academic “intellectuals” of the type who should be mopping floors. In other words this whole machine simply collects and then dissipates and destroys resources of all types. Our Islamic countrymen tried twice to take down the World Trade Center and succeeded the second time. Their European coreligionists tried to destroy Notre Dame a few years ago too. Yet the firemen had hardly arrived at Notre Dame when French officials ruled it an accident. Such efficiency suggests they had the investigation completed before the fire occurred. Which reminds me of a joke. A barn will burn to the ground in two hours if left alone, but a good volunteer fire department can make it last all day. Notice how Obama never had a close white, male Washington insider advisor. Never played golf with the any members of Chevy Chase CC; so no in-crowd members really knew him. Michelle never tried to mix it up with the Georgetown Ladies set either. Not saying this is a bad thing, but it demonstrates how the Obamas were working undercover from Day One in 2008. No media curiosity about this either. I think they knew he was high as a kite a lot. In way over his head and he knew it. That’s where the sine qua non of the novel’s allure comes in: its comedy. An inspired hybrid of introductory logic and advanced Marx Brothers, the humor of Catch-22 is like a manic, dissolute, indefatigably inventive friend. For much of the book, Heller’s comic touch is so delicately tuned that he can say just about anything and the result is delight. Heller is a master of the elliptical, cumulative, deliberately frustrating internal illogic of certain kinds of vaudeville patter. Population loss can cause serious problems. It can, for example, lead to sprawl without growth, which depresses housing prices and causes home abandonment. And it causes fiscal stress for local governments because so many of their costs are fixed or semi-fixed, such as bond payments and the need to maintain infrastructure. Charles Smith at Of Two Minds sees what's coming, and it ain't good. Pozdrowienia dla moich czytelników w Polsce. Saudações aos meus leitores no Brasil. The missus was not released from the hospital midweek, but retained for some additional days. Now she's back at Woodpile Report Global Headquarters and Jiffy Screen Door Repair, wobbly but looking better. Still, it took her all afternoon just to split and pile two cords of firewood. Kidding. Okay, enough chitchat for now. Let's get to Yer Ol' Woodpile Report, starting with this old ad. Lincoln Motor Company manufactured Liberty aircraft engines during World War I, then converted its operations to produce the Lincoln Model L in 1920, a luxury car featuring a V8 engine based on Liberty technology. 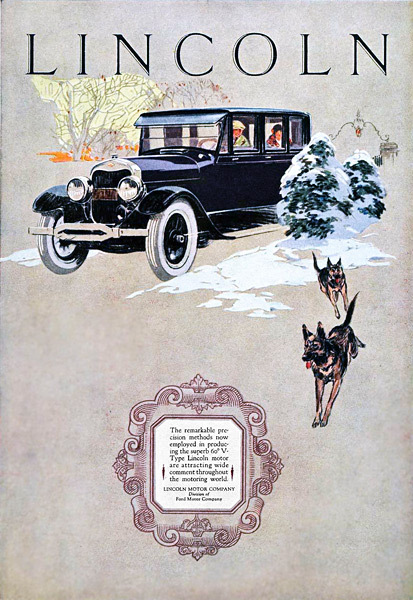 By 1922 the company was near bankruptcy and Ford, with no car in its class, bought it. The 1925 L Series had the same engine, transmission and wheelbase as the '22 but with 4-wheel brakes and restyling carried over from the 1924 model. The series ended in 1930, replaced with the even more expensive Model K.
The ad copy is a coy understatement: "The remarkable precision methods now employed in producing the superb 60° V-Type Lincoln motor are attracting wide comment throughout the motoring world". Who knew there was a motoring world. Be aware The Trace is Bloomberg's anti-gun website, yet this expose is a "must read" for defenders of the second amendment. The NRA is in seriously deep financial trouble, this much is public knowledge. The NRA may founder and collapse, in fact, this is a likely outcome. If this essay is even mostly true, the NRA has been looted into insolvency.
" ... Wayne’s [Wayne LaPierre] compensation rose rapidly from about $250,000 a year to almost $1,000,000.00. In the latest available IRS report from 2017, LaPierre’s total compensation was reported at $1.4 million, or about $117,000 per month, and a couple of years before that, he also got a distribution from his retirement fund of about $4 million, for a total compensation of more than $5 million that year. It’s worth noting that he’s receiving this at a time when the NRA is over $30 million in the red, and the retirement fund is in negative numbers to the tune of almost $60 million. ... Wives, children, and other relatives of NRA executives and NRA contractors have routinely crisscrossed between the NRA and various vendors, drawing exorbitant salaries". Fairfax has always smelled of elitism and the callous corruption that goes with it. Unless the NRA has a "come to Jesus" moment and acts on it, prepare for a shock. It may not survive. It may not deserve to survive. Cop killed, health worker injured. Attacks on clinics are common. Police baffled. Perhaps they should ask Pujuth Jayasundara, Sri Lanka’s police chief. He warned in bulletins that Islamic extremists—specifically, the National Thowheeth Jama'ath inspired by imam Moulvi Hashim—were plotting bomb attacks on ‘prominent churches’ ten days before they happened . For some reason, no precautions were taken. It's a mystery. They're looking into it. The fire of 1481 destroyed the spires and the roof. The spires were never replaced . Long time WPR readers will get a knowing grin out of this post. Every time the Permian Extinction of 252 million years ago is "proven" to have been caused by this or that—and the list is long—I've noted it here. And each time it's a different cause. No mystery. It's a 45 percent black school with a white-hating Social Justice Club and a parent Diversity Committee out looking for miscreants. The principal at a Chicago middle school recently removed the mural after self-appointed representatives of the institution’s 45-percent-nonwhite student population complained that the painting didn’t show people who looked like them, and if they can’t see paintings of people who look like them, how are they going to perform well on math tests, even though, if you want to get all technical, Asian students don’t need to be adequately represented in pictorials in order to score well in math, so maybe you should quit blaming your innate evolutionary cognitive deficiencies on racist paintings. Washington Times - Yankees ban Kate Smith's 'God Bless America' over 'history of potential racism' ... "we are erring on the side of sensitivity"
At least they admit they're erring. "God Bless America" was written by Irving Berlin for a World War I musical, but set aside unused. With the specter of another war, Kate Smith sang it on the radio for the first time on Armistice Day November 10, 1938 . Her 1939 recording has been played at Yankee Stadium for eighteen years. The Philadelphia Flyers have also banned it and covered up her statue. As always, pre-terrified management scurried like cockroaches when some SJW said "boo". Pardon me for thinking this has less to do with a novelty number about "darkies" recorded almost ninety years ago than with the song itself - God Bless America. Excerpt: "The fact that Atuno is black and his victims are white, coupled with security video that shows Atuno circling the cul-de-sac before slamming into the boys and driving off, suggests the possibility of a hate crime enhancement. Yet except for local media, the story has gone largely untouched. None of the three major networks has reported the crime, and neither have The New York Times or Washington Post". Moral decay, Of Two Minds - There's a phrase that describes a socio-economic system becoming the means for personal aggrandizement at the expense of civil society itself: moral decay. How else can we describe a system whose inputs and processes are rigged so the output is the vast majority of all income gains flow to the top 0.1%? There is a name for this institutionalized, commoditized fraud: moral decay. Moral decay is the only possible output of systems that place the accumulation of personal wealth and political power above all other civic and economic values. When every system is nothing but a means to institutionalize and commodify fraud and extralegal privilege, there is no saving such a perversely asymmetric system from internal collapse. Notre Dame, Front Page Magazine - Buildings like Notre Dame do not erupt into flames spontaneously. That’s not how God works, even to punish a civilization as deep in moral ruin as ours. My suspicions, and those of almost everyone I know, are hardly calmed when we see Fox News—yes, even Fox—repeatedly refusing to host an honest discussion of the possibility, even as experts tell French TV that eight hundred year old timber simply doesn’t burn that way without an accelerant. It’s not as though news networks restrain their hosts from wild speculation during other crises. So, understandably, the first reaction from anyone who has been reading the news lately was: “Muslims, right?” Alas, even Right-wing newsreaders are terrified of saying the wrong thing when the perp might be a member of the Religion of Peace. Global warming, Traditional Right - Global warming advocates have misused a worst-case scenario to generate panic. Theirs is an ideology of which we should warn even more strongly than other ideologies, because, again, everything we do affects the environment. This makes their demand for total control seem even more justifiable. Add in widespread public panic over increasingly volatile weather and you have an excellent basis on which everyone should surrender their freedom. Why, humanity itself stands on the brink of extinction. How can you justify your puny desires to do as you please? Soak the rich, Daily Bell - Imagine starting a small business in the USA in 1875. Imagine working for yourself, or building a company from scratch. With no corporate taxes, and no income taxes, you kept the full rewards of your risk and labor. It’s not surprising that in about 100 years the United States went from non-existent, to having the largest economy in the world. Unparalleled economic freedom helped create the industrial revolution which spurred legendary economic growth from 1870 through the turn of the century. For most of the 19th century, the main source of tax revenue for the federal government was tariffs—taxes on imported goods. But in 1913, everything changed. Still true: Businesses don't pay taxes, they collect them. White guilt, Spectator - I remember that first wave of White Guilt washing over me. It was like an epiphany. I bathed in it, swam in it. Immersed my disgustingly pallid complexion in it until I was spent. From then on, I was transformed. I found myself telling people to ‘educate themselves. I was using the word ‘problematic’ at least three hundred times a day. Many of my student chums are also aware of their White Guilt. Only last weekend we berated a white homeless man sitting outside Taco Bell for his appalling lack of self-awareness regarding not only his own privilege, but his flagrant disrespect towards cultural appropriation. We need to do more, and I am determined that when I inherit my family’s estate, I will make damn sure I only employ people of color to maintain it. A parking lot. The '41s and '42s were designed and tooled up knowing they'd be the last to be manufactured before the war, and knowing the production lines would be reinstalled after the war. 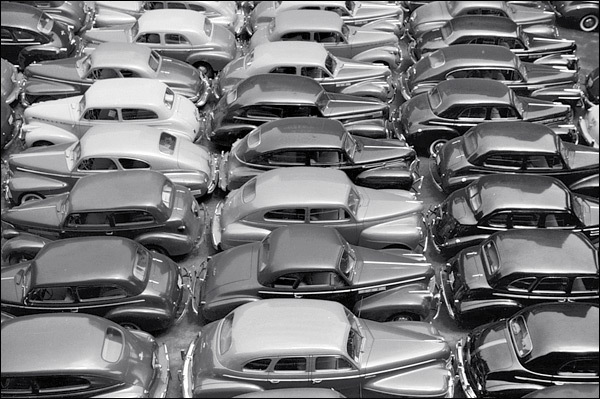 Production of automobiles ceased in early 1942. Production of prewar cars resumed at the end of the war in 1945, with some cosmetic refreshing. New models didn't hit the showrooms until late in 1948. Beauty, Nautilus - Experiments have become too costly to rely on serendipitous discoveries. Beauty-based methods have historically not worked. They still don’t work. It’s time that physicists take note. There are good reasons to think physics is not done. The Standard Model cannot be the last word, notably because it does not contain gravity and fails to account for the masses of neutrinos. It also describes neither dark matter nor dark energy, which are necessary to explain galactic structures. So, clearly, the foundations of physics have problems that require answers. Physicists should focus on those. And we currently have no reason to think that colliding particles at the next higher energies will help solve any of the existing problems. Nevada fault, Wired - U.S. route 395 is a geologic master class disguised as a road. It runs north from Los Angeles, up to Reno along the eastern flank of the Sierra Nevada. On the way, they pass the black cinder cones of Coso Volcanic Field and the eroded scars of a mighty 19th-century earthquake near Lone Pine. In winter, drivers might see steam rising from Hot Creek, where water boils up from an active supervolcano deep underground. Mono Lake appears, with its bulbous and surreal mineral formations known as tufa towers. They are clues to a great tectonic mystery unfolding in the American West. From the wastes of the Mojave Desert to the night-lit casinos of Reno, it will someday be beachfront property. No need to plan your decampment or mark your calendar. Excerpt: " ... this geologic realignment will take long enough for human civilization to fall, rise, and fall again hundreds of times over"
Dmitry Orlov, The Saker - The USA, as some set of institutions that serves the interests of some dwindling number of people, is likely to continue functioning for quite some time. I think that the American empire is very much over already, but it hasn’t been put to any sort of serious stress test yet. Some event will come along which will leave the power center utterly humiliated and unable to countenance this humiliation and make adjustments. When the end of the US finally arrives, most of the people won’t be capable of absorbing that sort of upsetting information and will choose to ignore it. Everybody wants to know how the story ends, but that sort of information probably isn’t good for anyone’s sanity. The mental climate in the US is already sick enough; why should we want to make it even sicker? Most of this interview is about the Ukraine and the EU. Orlov's observations about the US are in the last part. 4th Turning, Burning Platform - It wasn't a coincidence World War II began exactly eighty years after the onset of the American Civil War, which began as compromisers died off and hearts hardened on both sides. We are now eighty years gone since the outset of World War II and a global mood of impending doom overshadows our daily lives. The inevitability of conflict, domestically and internationally, eclipses all efforts to bridge the ideological differences of competing interests around the world. The cycles of history will not be denied and this Fourth Turning will play out as those before, with clear victors and clear losers. By war's end there were 65,000 Army and Navy nurses serving for "the duration plus six months". 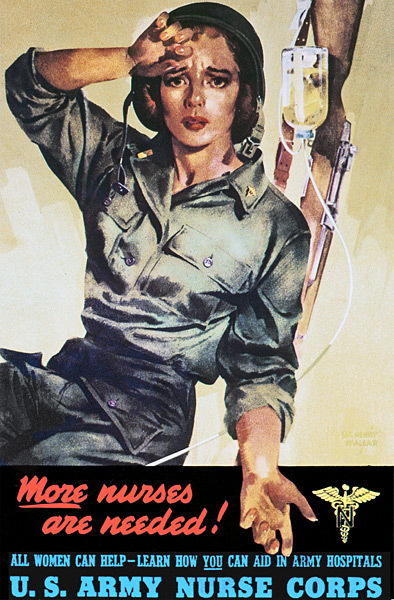 The lieutenant's bar dates this poster, nurses gained official military rank in February 1944.